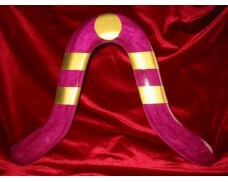 RA Boomerang -Red & Gold. 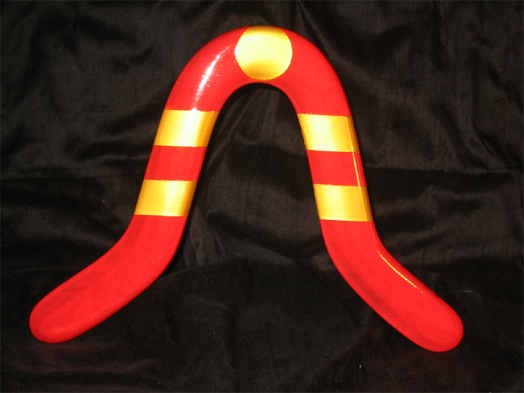 RA Boomerang -Red & Gold. 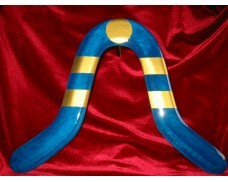 This RA boomerang tends to fly higher than more advanced styles like the Kamikaze or Superfly. This style tends to hover, is quite easy to catch, and flies a good distance. 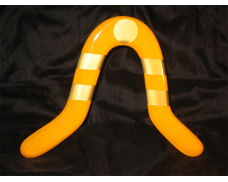 It is also safer and easier to throw and catch due to its smaller size and unique shape. It also creates an interesting circle within a circle pattern when airborne. 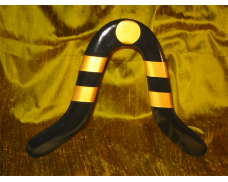 All DGM Boomerangs are high quality, hand crafted, durable works of art that fly superbly, actually DO come back, and will give you hours of pleasure. The first step in the process is choosing the best Russian Birch wood which affords the finest weight, texture, and aerodynamically correct structure. 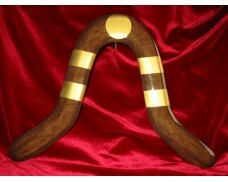 The boomerang is cut and shaped using hand tools to reveal the perfectly shaped style of boomerang. 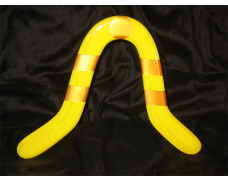 Once the cutting and shaping have occurred, the boomerang is tested and tuned quadruple times to ensure integrity in shape and flight pattern, and the wood is properly cured into the right shape. I use only water based, non-toxic stains, paints, and clear coats that ensure durability, aesthetic visual appeal, and functionality. Every preparatory step is meticulously performed - I do not use spray paint, every layer is applied by hand. All products are made in Canada by me directly. 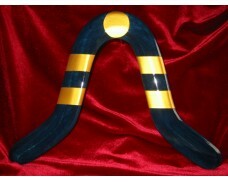 I do not exploit anyone or cut corners to mass produce my boomerangs. 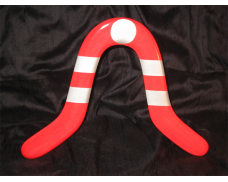 Beginner to Intermediate Skill Level Available in a variety of colours Don't see a color y..